High gloss concrete sealers not only help to seal and protect your surface from elements, but they also provide the concrete surface with a beautiful finish that is admired by neighbors and passersby. Read this High Gloss Concrete sealer reviews to know more about it. Over the years, there has been a steady growth of concrete as a finish for both interior and exterior surfaces. More so, there has been a rise in the demand for decorative concrete with a high gloss or shiny finish. This has lead to an increased demand for high gloss concrete sealers with vibrant finishes. Being a professional concrete contractor, I’ve helped my customers seal and beautify their concretes for years. And in this post, I want to share with you some of the best high gloss concrete sealers so that you can change the look of your surface and offer protection to your driveway, patio, kitchen floor, or sidewalk. 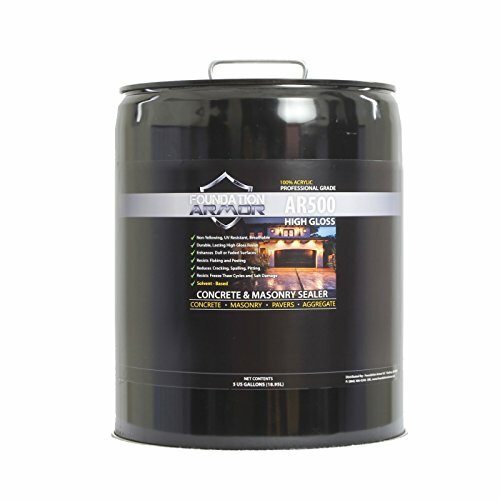 Foundation Armor AR500 high gloss concrete sealer is a unique pure acrylic lacquer created to enhance a dull or faded surface. When applied, the sealer penetrates deep into the pores leaving behind a long-lasting, UV resistant high gloss finish. The sealer is suitable for homeowners looking for an easy to apply, professional grade sealer for interior and exterior concrete floors. The 5 gallons can cover up to 500 square feet in two coats. It provides resistance to chemicals, water, salt, and stains from damaging the surface. If you want your concrete to look beautiful with a shiny high gloss finish, Quikrete is the sealer for you. The water-based, high-gloss, acrylic sealer decorates your concrete like no any other sealer. At the same time, it enhances the color of the surfaces and resists water, salt, stains, and other elements from damaging the concrete. You can apply it on concrete or masonry surfaces. 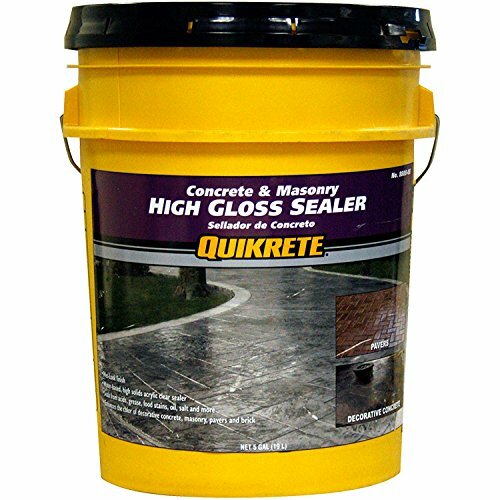 This is one of the best concrete sealer for applying in high traffic areas. The Rainguard international acrylic high gloss sealer is made up of a mix of acrylic and urethane to offer a powerful and durable coating. The non-yellowing formula repels damage from UV rays, water, salt, chemicals, and inhibits the growth of mold and mildew. Moreover, it resists hot tire pick-up for application in the warehouse, automotive, residential, and commercial areas. 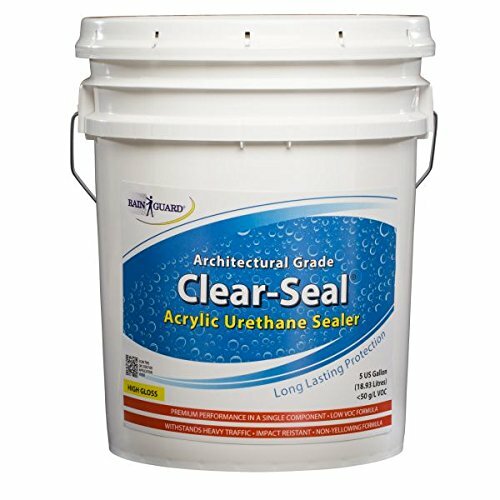 Unlike other sealers, this one is a bit safe to use as it is low VOC and non-toxic. It is not the best high gloss out there. Some clients complained that it turns milky when wet for too long. As you choose your best high gloss concrete sealer, it is important to consider other factors like protection offered, durability, and price of the sealer. Combining all these factors will help you to acquire a high quality and reliable concrete sealer that will last for many years. Q. When should I seal my concrete? Ans. Both new and old concretes should be sealed. Old concrete can be resealed immediately after resurfacing, while new concretes should be left to cure for at least 6 months before being sealed. If you don’t know what to do, you can always get in touch with a professional concrete contractor. Q. How will my concrete look after applying a high gloss concrete sealer? Ans. If you want a shiny looking and spectacular concrete, using a high gloss concrete sealer is the best thing. It provides a more luxurious look and the concrete will be more vibrant. Still, have a question after reading this High Gloss Concrete Sealer Reviews? Comment below.